Ultius.com has been in business since 2010 and states that it is a fully American company with only American writers. It offers academic and business writing products, editing and proofreading, admissions essays, and resumes/CV. We have prepared this review as an objective accounting of all aspects of the company, and have used several sources for information – the site itself, Ultius testimonials that the services publishes on the site, other customer and employee reviews found on social media and writing review sites, as well as an evaluation of a research paper we ordered ourselves. The following is the result of our investigation. 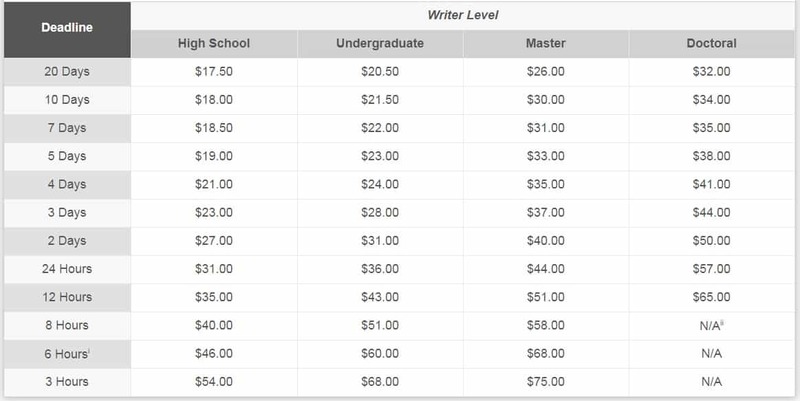 All types of academic writing products are available, starting at the high school level and proceeding through the doctoral dissertation level. Graduate level products include theses and dissertation chapters. Business writing includes only resumes and CV’s. Editing is available as well. We called the customer service department to ask questions about dissertation work, available writers, qualifications of writers, and about progressive delivery and payments. The representative was pleasant but was unable to answer our questions. She too our phone number and stated someone would return our call with the information. That never happened. We base trustworthiness on the actual performance as it relates to following customer instructions in the production of written works, the meeting of deadlines, protection of personal information and security in payment procedures. All Ultius customer reviews indicated that deadlines are consistently met. A few customers voiced concerns that their specific instructions were not completely followed and that they work had to be returned for revisions. According to the site, personal information of customers is digitally protected and is not shared. As well payment procedures (major credit cards and PayPal) are processed securely through a third-party with SSL security certification. Based upon these factors, we can definitely state that Ultius is not a scam. The company states that all of its writers are American and that they all possess graduate degrees. There is no way to check that. In terms of writer quality, there are no major complaints, although some customers have stated that they did have to send work back for revisions before they were satisfied. The paper we ordered was received on time. The writing quality was appropriate for the undergraduate level, although there were some obvious grammatical issues, and the resources used were adequate. The writer make several errors in formatting and we did have to return the work for correction. Writer expertise is assessed based upon sample writings on the site itself as well as anonymous comments from the writers themselves on employee review sites. Several writers stated that they were producing research works outside of their major fields of study, and this is a cause for some concern. As well, some of the grammar used by the writers in preparing their comments indicated that they may be ESL themselves. Ultius.com prices are a bit higher than average. An 8-page research paper that we ordered was $176.00. Because there were no Ultius discounts for new customers, we had to pay that full price. We saw no mention of Ultius.com coupon codes which is common with other services, although there was a place on the order form for a customer to add an Ultius promo code that is evidently reserved for “loyal” customers. There is no definition of that term on the site, so we assume it is something awarded through customer service at some point. Ultius does offer free title and bibliography pages as well as free revisions if an order has failed to adhere to a customer’s instructions. Beyond these three items, there did not appear to be any other benefits. 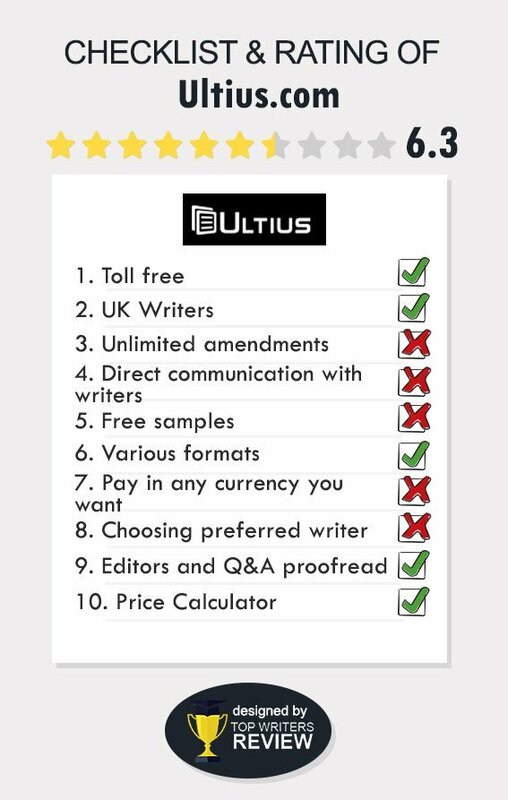 Our Ultius review revealed that the company is legitimately in the business of providing writing services to its customers. As well Ultius BBB rating is “A,” another sign that it is very legitimate. If we were to discuss overall Ultius.com pros & cons, we would state that customers do get what they order and deadlines are met. Our experience and that of several other customers is that often the works have to be returned because customer instructions were not followed. It wouldn`t be fair to say that this service is bad. They were friendly and helpful. Unfortunately, the quality of the writing they do is just not good enough for academic purposes. I had to work on the structure of my paper for some time even after receiving it from an "expert". Also, I needed to check all the references as I just didn`t believe they were not fake. It was my first time using Ultius and I saw many positive testimonials on the web. They reacted promptly on my order but eventually it was returned late. They did refund me but the overall process was stressful. I also think that their prices are rather expensive. You`d better don`t waste the time waiting for them to do anything at all. The maximum you get is the low-quality piece of paper that would gladly lower your level of self-esteem. Wanna get it? Then feel free to phone them in. Oh, sorry, they won`t pick up as they don`t have a phone number. Well, good luck. I would never try their writing help again! I used Ultius services once quite a while ago and then switched to another company. Now I decided to give them a second chance.. and missed again. Their prices have raised even more and I can't see any change in the quality they deliver except for the new feature that tells you when to expect your order. I wish they'd work on timely delivery rather than on blunt recognition of their own incompetence.